ng-repeat is similar to foreach loop in C#. Let us understand this with an example. Here is what we want to do. Script.js : The controll function builds the model for the view. The model employees has the list of all employees. HtmlPage1.html : In the view, we are using ng-repeat directive which loops thru each employee in employees array. 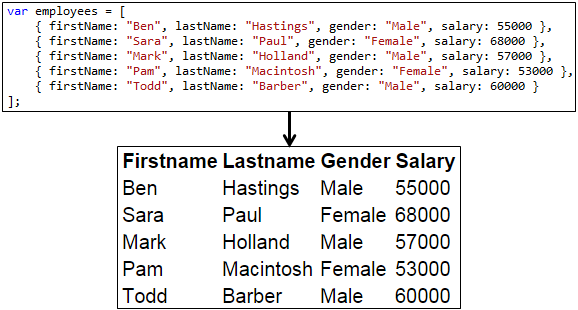 For each employee, we a get a table row, and in each table cell of the table row, the respective employee details (Firstname, Lastname, Gender, Salary) are retrieved using the angular binding expression. 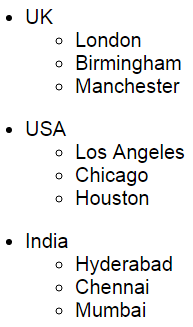 Nested ng-repeat example : The model contains an array of countries, and each country has an array of cities. The view must display cities nested under their respective country. Script.js : The model is an array of countries. Each country contains an array of cities. HtmlPage1.html : Notice that we are using two ng-repeat directives in the view, one nested inside the other. The outer ng-repeat directive loops thru each country in the model. The inner ng-repeat directive loops thru each city of a given country. Suppose I want to use the dike dislike functionality in my project and I dont want the repeat process. In that case what should i have to write in the place of ng-repeat? country then i have to show states in it. i want show and hide states based on user clicked country.